Ducati superbikes have long been known for running fairly warm. The rear cylinder’s header pipe connects to the engine just under the seat on some of the latest Ducati sportbikes and tends to create an often uncomfortable amount of heat for riders on warm summer days. Header pipe heat issues are now the least of a gentleman who goes by Nitrouz on DucatiForum.com. 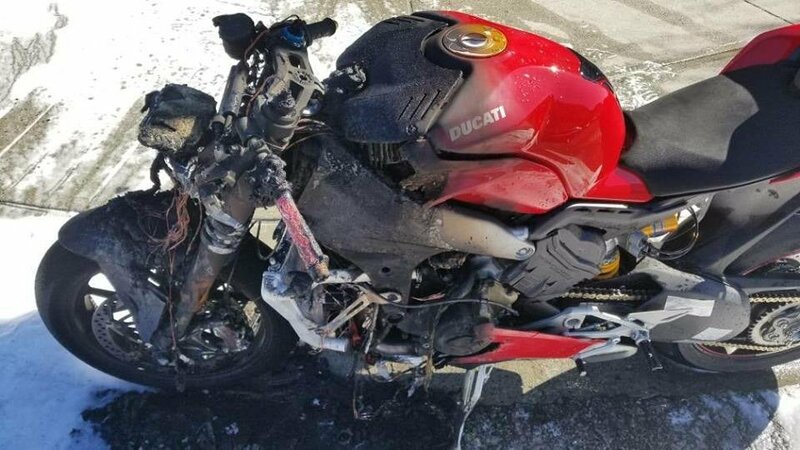 On March 15th, his brand new Ducati Panigale V4 burst into flames on the side of a busy street in Vancouver, British Columbia. Fortunately, he states that Ducati is expediting his warranty claim – since there’s not much left of his bike. 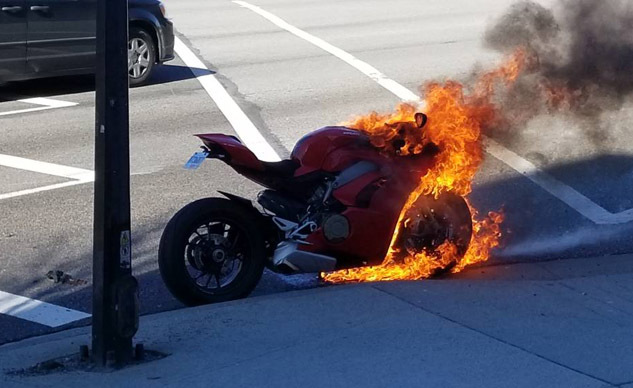 Nitrouz claims he was riding his new Ducati as normal through the city when he smelled something burning and looked down to see that his new baby had caught on fire. The rider then pulled to the side of the street as the fire engulfed the beautiful Italian motorcycle. Ducati North America immediately reached out to the owner ensuring him a new motorcycle and that they will do everything they can to take care of him. He has since thanked Ducati numerous times for taking care of him and has taken down the photos from the forum on his own accord. Of course, the question remains, was this an isolated incident or will we see a recall from Ducati in the near future. I’m sure we aren’t the only ones hoping for this to be an isolated incident involving what is destined to be a benchmark in the sportbike category. We are glad to see no one was hurt and that the rider is okay. Also, we are proud of Ducati North America for reaching out to, and easing the mind of the gentleman involved, so quickly. We will be keeping our fingers crossed for Ducati and new Panigale V4 owners that this was simply a fluke. We have reached out to Ducati North America and have yet to receive any information. Just when we thought the only smoke coming from the Ducati Panigale V4 would be from a spinning rear tire.